2P START! Live! : Super Sonic Racing Edition | 2P START! 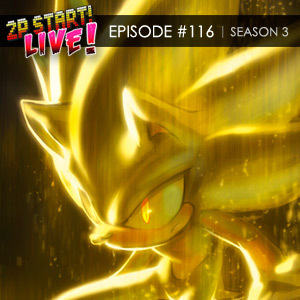 Ray sinks his teeth into Sonic & Sega All Stars Racing, Tim reacts to a fan video, a caller’s transcript goes too far, and Tim details a different time he was ‘technically’ arrested. I think *Listens to* would be more appropriate in this situation. Unless, of course, you literally just turn of your sound and let it run to look at the pictures. Oooh, early podcast! My video is mentioned too! AWESOME! Yay! New podcast! Thanks, guys! ^Yes, we know, you guys don’t need to tell us. But Ray, unless a fan created the Bayonetta ending, the link on this page seems to be wrong. … It’s not working on the picture under the podcast. I keep getting the Bayonetta ending. Yeah, I’m still getting the Bayonetta clip too, even after clearing my cache just in case. Nice job, guys! I really enjoyed this one! Though, to me, it seemed a bit late, it was defintely worth it and an improvement from the last pod. Keep up the…*seaches for a new adjective*…nice…work! 1. Can’t tell what this week’s intro sound effect is. 2. Nintendo Media Summit: aside from Super Mario Galaxy 2, my big pick of the Summit games is WarioWare: D.I.Y. Finally, you can actually make your own WarioWare Microgames! I’m going to be getting it on release day. Will we see 2P START! microgames from Tim and Ray? 3. Is that Concept Art or something on the M4A art? 5. Character DLC I’d like: Blaze the Cat (why Big?). Puyo Puyo characters. A Rappy. Space Harrier. CLASSIC AMY! 6. Don’t knock ModNation Racers! The Beta was a bit scratchy, but they’ll improve for later. 7. 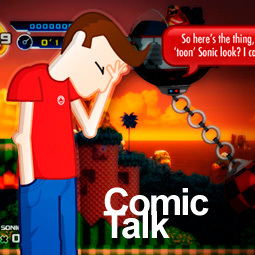 What’s the new Comic Talk intro music? And what’s with the Animal Crossing music? Couldn’t you have had some Sonic Music? Or did you not want to argue Jun Senoue and the estate of Micheal Jackson? 8. Sonic HD Remix. LOL. Ray, you’re still the naysayer you always have been. 9. I can’t remember when I last heard Ray’s lifeguard days being mentioned, but I can visualise him being the Lifeguard for Tim’s swimming pool full of money. 10. 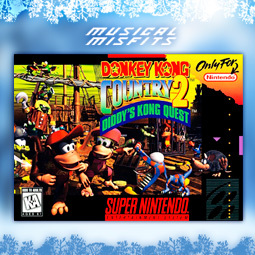 A remix featuring the MOST AWESOME FILE SELECT MUSIC EVER! 12. Character Select Loading: SEGA Tennis suffers from that problem. Brawl did it right… except for ? boxes! And TvC went round in a ring! And good music choice! 13. Aww… my Musical Misfit wasn’t selected. I’m not sure this misfit even appeared in the last podcast’s comments! But, it was a cool one nevertheless! Re: 9. Floors are slippery when cashed. 8. Super Sonic the Hedgehog 4 Episode 1 Ultra Turbo Hyper Extreme Edition the Downloadble Game in HD. Hey, this is Sega, not Capcom. The difference is Sega has names that try to tap into 80s and early 90s “hip speak,” whereas Capcom game names always seem to sound like a straight Japanese-to-English translation (“Devil May Cry”? Seriously?). Thanks for sharing my voice mail on the show! I thought you guys would like that question. Thanks for mentioning my comment about the Knubby elbow fetish. The “NEW Sonic the Hedgehog” vs “Sonic 4” thing mostly comes from how much they are recycling stuff (like Robotnik’s um, “Wrecking” ball and past badniks?. They seem to be playing the “Nostalgia card” more than making a new Sonic game. All you have to do is add 4-payer co-op and you have a Sonic version of NSMBWii. Loved, even if unintentional, the transition between Ricky-ricky remix and Rise from your grave segments, the low health beeping noise before you die, then wise from your grave. For character select screens, agree pretty much to what you said, and I would add, not being able to unselect or go back to main menu, like in Tatsunoko, or is there a way I don’t know of? 2 rainbow roads would not be a great idea, imagine a cup with those 2 tracks in it… that’s what, 15 minutes? but similar themed track can lower the experience a bit, but not always. PS- after listening to the podcast I skipped, I felt a sudden urge to listen to loon sounds on youtube. Hmm… my first comment didn’t seem to get submitted… probably screwed something up on my end. Anyways, I basically said that Guitar Hero III on the PS2 had one of the worst menus of all time for its long loading times, carousel selection, and too many similiar items. And that it’s annoying to get in trouble for something you didn’t do, but are considered to have done because you were standing with the group who did. I suppose it’s like getting arrested for something you didn’t do. (If this makes any sense.) Great podcast guys! I just listened to it, and I have to say; Great show! Comic Talk was interesting, Off-Topic was hilarious, and I’m thrilled that you guys liked my video, it was fun listening to Tim’s “live” reaction. I’ve listened to a few of the podcasts but somthing has been bugging me, what zone is the music you play at the begining of the black doom awards from? Mystic Cave Zone from Sonic 2. I can’t say I planned on the transition, but once I realized what it could be I massaged it a little bit for maximum effect. Curious about something. Where’s the avatar from, and what does the text say? The most I can decipher from using the Mac’s zoom-in feature is “Starbucks forced my whipped cream again”… which leaves me confused. Hmmm… “Starbucks forced my whipped cream again.” Could it be “Starbucks forgot my whipped cream again?” I know the character in the avatar has Starbucks drink and a lot of coffee shops seem to forget the whipped cream. No really, it happened to me today at a Coffee Bean and Tea. That “delay period after dying” idea sounds pretty good actually; maybe not 24 hours, but even 5-10 minutes would be a good motivator to not die — not long enough to really go do something else in the mean time, and not short enough to just regularly abuse death. Saw the video, and it was pretty awesome (kudos SuperSonic24!) The dog poop bit was also my favorite part. 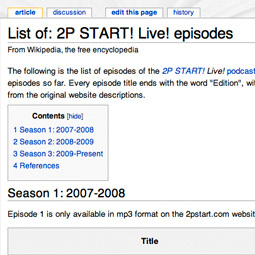 I also happened upon the Wikipedia Podcast list earlier today; didn’t realize it was so recent — awesome stuff there. 1. $0.39 cheeseburgers during your college days? ……How old ARE you, Tim?! I haven’t seen prices that low in my LIFETIME, and I’ve currently gone through ~4 years of college! 2. Aww, love-bird g-risers. How cute. I like the Tim with the news intro actually. I agree the SaSASR doesn’t really roll off the tongue. Even the acronym isn’t that easy to use. I totally agree with the track use. I was mad that Casino Nights got as much play and something like a Space Channel Five track or a ChuChu Rocket track was ignored entirely. Imagine racing away from giant orange cats and hitting directional arrows sending you to different spots. Honestly, I was kinda glad with the character selection. There were some characters I wanted, any Streets of Rage characters in a police car in psrticular, but on the other hand I never expected Jacky and Akira to be in there. It all sorta balanced out to me. I was just upset with the track choices. That’s about all I was really upset with. Otherwise I’ve been enjoying it quite a bit but then again I’m a sucker for any type of crossover. Also I still say Sonic and Sega All Stars Slam is coming next. I couldn’t imagine the comic being done in the podcast. The visual joke really works. Ray I agree. That’s one think I hated about Tatsunoko vs Capcom. If you want to see a character’s alternative costume it has to load the whole model in the preview. I just want to know if third player gives a black dress or white dress for Chun Li. I miss question marks too. Its one of those things that have just disappeared from modern games, like health meters in shooters and beat ’em ups. Awww, no secret message at the end. Those are always my favorite part! Not if Sonic’s already been in Brawl. I’d think they’d do a new Fighters Megamix with all the franchises represented in SSASR and more besides, plus of course Virtua Fighter, Fighting Vipers, Bean the Dynamite, Bark the Polar Bear, the AM2 palm tree, and The Daytona Hornet. Yeah, the Bonus Segment is one of my favorites as well… They certainly seem to be on their way out, as they’ve been appearing a lot less regularly since the Off-Topic segment began. Or has it been since Ray and Tim got their new mics? Mainly since the Off Topic segment began. That’s the main reason why it was created really, because of peoples’ interest in the bonus content at the end. I’d venture to guess that we’ll still get the occasional blurb or outtake at the end of the podcast, but otherwise it’ll be put in the Off Topic segment. There’s a difference, though. 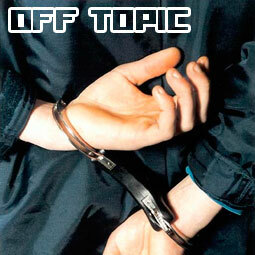 Off-Topic is a planned segment, with a prepared subject. Bonus, on the other hand is always just a spontanious “speaking of which” derail. 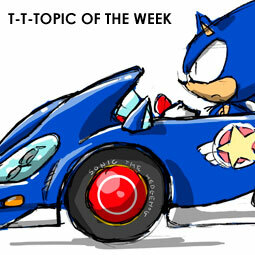 So far, I do like Off-Topic more than Bonus, but I’d rather just have both. Who’s gonna pick up Sonic Classic Collection for DS? That’s one of the games that SEGA can’t screw up I suppose. I have to say, guys, your podcasts over the last few weeks have become increasingly cynical and, frankly, this podcast was almost nothing but you guys complaining. Don’t get me wrong, I love the podcast and the comic, but lately the podcast has been dropping with sarcasm to a point where its almost not funny anymore. I enjoy the Black Doom awards because they’re celebrating stupidity, but I feel some of the things said on this one were complaints for the sake of complaining. Thanks for the feedback, Zacko. Out of curiosity, what would you consider to be the moments of complaining just for the sake of it? It wasn’t so much specific things that were said, its more that the overall tone of the podcast has been much more sarcastic as of late. Bordering on pompus? Being somebody who has their hand in podcasting, I didn’t appreciate how you started the podcast. “We’re a podcast that actually tries.” Really? REALLY?! How dare you. 🙂 Some of my favorite podcasts (and most popular) are nothing but unscripted, uncut podcasting delight with simple bumpers. Your personal taste and style doesn’t make everything else garbage. Granted, there are extremes, which I’m sure you meant. …maybe I’m the one complaining for the sake of complaining… Anyways, that’s my two cents. I know what’s missing from SEGA Superstars Racing! NiGHTS as a playable character! Were going to get more older style comics like numbers 1 and 2… that’s fantastic news this comic used to be good back then. Okay, it feels like I walked into one of Ray’s dreams. Two Sonic the Hedgehogs on the front page of 2PStart.com? Only thing that would complete the cycle is Ray expounding on the virtues of an open-world Sonic game. I’m sure Tim longs for the day when there’s a Bad News Baseball comic and podcast image on the site at the same time. I agree with your Black Doom, Ray. Nothing beats the good old character portrait set-up. I do kind of like the lack of ?-slots, though. To an extend. Knowing exactly how many characters you still need to unlock kind of ruins the mystery and surprise. I personally love it when the game throws a couple of curve balls your way. To the point where I’m pretty much just expecting the game to do so, which is kind of too bad. Melee did that well. There were question marks to give you something to strive for, but it also gave you that exciting “Woah! There’s more? !” feeling after you unlocked your first clone character. Problem with that, though, was that Melee kept those two gaps in the selection screen’s bottom corners, which spawned the Sonic and Tails rumors. It’s Windbreak Bay from Wario Land: Shake It! I adore this game, and I think the music is great. I’m pretty sad to have seen so little love for the title, though. Am I really the only person who could appreciate it that much? Has anyone who owns “Sonic and Sega All-Stars racing” played through all of the characters enough to tell me how they handle? I want to know before I buy, so I don’t buy a game that I just crash into all the walls over and over and stuff. I just got the game yesterday and spent just a few hours playing. Going through the characters, they all perform smoothly and easy to handle. Airplanes (such as Tails’ plane) do perform differently than regular cars; airplanes kind of “float,” but still keep with cars easily. If you’re worrying about whether or not the characters are hard to handle, I got my brother to go a couple rounds with me. He hasn’t played a cart game since Crash Team Racing and I kind of forgot to explain the controls. Within a few races he was scoring second place and even beat me several times! If you’re worried about charcter variety, characters of the same class perform in a similiar manner. Cars will have a certain amount of traction and speed, airplanes will kind of float while maintaining speed, and bikes go quickly, but get bumped around easily. And I do mean easily. I’m still unlocking characters, so if there’s something unique that’s hidden, I do apologize for not knowing. I doubt you’ll have trouble crashing into walls and what not. Some people handle tightly others are a bit looser. On average though the sporty style cars like Sonic or Jacky from Virtua Fighter have good handling and the hovercrafts like Tails or Ulala don’t. There’s a pretty good selection of characters and they’re all pretty varied so there’s bound to be someone to suit your needs. If you’re looking for someone safe to drive without crashing I’d recommend Billy Hatcher. He’s an all around solid character ith decent stats, good handling, and a pretty useful all-star move. Sorry, I’m falling behind here. Just listened to this one. SPP (Spiffy Podcast Guys). Took me until just now to realize I fail at acronyms. And I did thats the lost woods. Makes scene other then the lack of any reference of the 3 goddesses in Link to the Past. Also last time I checked what song it was that was the Link to the Past remix and it didn’t sound anything like it. When playing Mario Games like NSMBW, I can’t go slow. I do best if I assume I am under a insane time limit where I can only stop running if I am trying to get something on screen (like a star coin or mushroom). Trying to go slow I die way more often. Now link to the past low health music with the sanctuary? How and I supposed to avoid playing Link to the Past now? Come on I only have 2 more weeks then I am done the semester than I can finally play! I was hoping should say you go arrested for buying to many hamburgers. That would have been better.